Welch Allyn 11710 3.5V Standard Ophthalmoscope (bulb included). Tested. 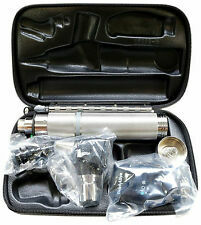 Otoscope Set with C Size Battery Handle. 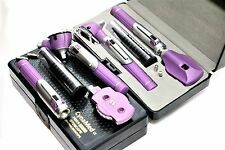 Otoscope Set takes C Size Battery Handle. Dwyer Photophilic Pressure Switch / Gauge Series 3000 NIB. Trending at $15.34eBay determines this price through a machine learned model of the product's sale prices within the last 90 days. One Handle, 3 Ear Spacula, 1 Nasal Adapter, 1 Head Lens Wheel. 2 Free Bulbs. CHOOSE THE DEAL AND COMPARE PRICES. This Set Included Credit Cards Over The Phone. 1 Nasal Adapter. 1 Head Lens Wheel. This Set Included Dwyer Photophilic Pressure Switch / Gauge Series 3000 NIB. Professional physicians 3.25V otoscope, ophthalmoscope, E.N.T diagnostic kit. The Otoscope lens is an Optical quality GLASS that is specially-coated to help resist scratches. The lens is hinged and swings out of the way if needed for foreign body removal or cleaning. CHOOSE THE DEAL AND COMPARE PRICES. "The sale of this item may be subject to regulation by the U.S. Food and Drug Administration and state and local regulatory agencies. Credit Cards Over The Phone. 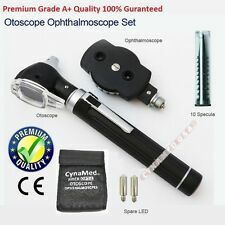 Mini Fiber optic otoscope opthalmoscope diagnostic set black Double handle. 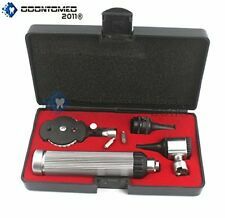 Professional physicians 3.25v otoscope, opthalmoscope, E.N.T diagnostic kit. Optical quality glass lens that is specially coated to help resist scratches. Professional physicians 3.25V otoscope, ophthalmoscope, Veterinary diagnostic kit. The Otoscope lens is an Optical quality GLASS that is specially-coated to help resist scratches. The lens is hinged and swings out of the way if needed for foreign body removal or cleaning. Trending at $111.75eBay determines this price through a machine learned model of the product's sale prices within the last 90 days. Welch Allyn Diagnostic Set 2 Heads, 2 Handles, 25 Specula and Soft Case Pocket Junior. The product images shown are for illustration purposes only and may not be an exact representation of the product. Model: 11710. The sale of this item may be subject to regulation by the U.S. Food and Drug Administration and state and local regulatory agencies. New ListingWelch Allyn 11710 3.5V Standard Ophthalmoscope (bulb included). Tested. 4.5 out of 5 stars - Welch Allyn 11710 3.5V Standard Ophthalmoscope (bulb included). Tested. 16 product ratings16 product ratings - Welch Allyn 11710 3.5V Standard Ophthalmoscope (bulb included). Tested. NEW FIBER OPTIC OTOSCOPE (POCKET FIT). X 3 MAGNIFYING SWIVEL LENS. EASY TO REPLACE COOL LONGLIFE 2.5 V LED LAMP. 2 AA BATTERY CELLS NOT INCLUDED. 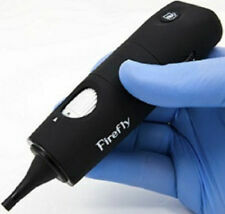 Easily converts into a penlight when otoscope head is removed. 1 x Mini Otoscope. Compact style fits easily in a breast pocket. New Knitting Tool Crochet Knitting Embroidery Needle Knitting Tool. Top USA Distributor. Otoscope & Ophthalmoscope Set Requires 2 (Two) C Batteries. Always Best Quality! OUR PRODUCT RANGE. Our production process has attained ISO 9001:2008, ISO 13485:2003 certification, cGMP compliant and CE certification. The lens in our Pocket Otoscope is the key to making a high-quality, affordable otoscope. The Original Doctor Mom Otoscope ®. Replaceable batteries are included. Uses standard pediatric and adult disposable specula. 1 Ophthalmoscope Head. 1 Otoscope Head with LED Bulb. SET INCLUDES. New Arrivals. Requires two "c" Batteries ( Not Included). Includes a spare 2.5V Halogen Lamp. Outstanding Optics. Ending Soon. One of the best otoscopes on the market right now. 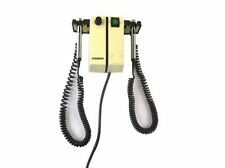 You are purchasing ONE Piece of the Welch Allyn WA-03100 Compatible Bulb Lamp 03100, 3100, WA03100,WA-03100-U. 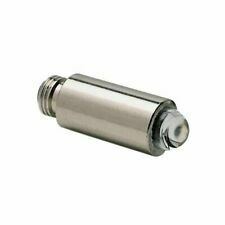 Otoscopes-20000,25020,21700,20200,20202,25000 & 25200 3.5v Handle Adapter-73500 Tongue Blade Holder-28100. 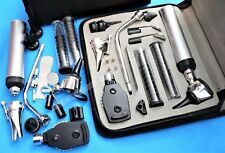 Ent Opthalmoscope Ophthalmoscope Otoscope Nasal Diagnostic Set Kit This Set Included One Handle, 3 Ear Spacula, 1 Illuminator, 2 Mirrors, 1 Nasal Adapter, 1 Head Lens Wheel. CHOOSE THE DEAL AND COMPARE PRICES. Welch Allyn 3.5 V Halogen Standard Ophthalmoscope; Power Handle Not Included 11710. Welch Allyn Universal Kleenspec Single-Use Disposable Otoscope. • Adult Specula. 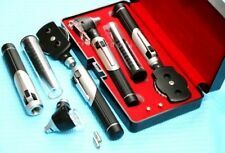 1 Set of Fiber Optic Mini Otoscope Black Color (Diagnostic Set). Dwyer Photophilic Pressure Switch / Gauge Series 3000 NIB. Orignal CynaMed Brand,4 FREE BULB,Premium Quality ! CHOOSE THE DEAL AND COMPARE PRICES. Credit Cards Over The Phone. "The sale of this item may be subject to regulation by the U.S. Food and Drug Administration and state and local regulatory agencies. Alligator Forcep 3.5". EAR SPACULA. BOTTLE SPARE SPECULAS. HEAD LENS WHEEL. We can match or beat all of our competitors prices. Located in the United States. "The sale of this item may be subject to regulation by the U.S. Food and Drug Administration and state and local regulatory agencies. Get fast temporary relief of discomfort using the Eustachi Eustachian Tube. This conditioner unblocks your ears by helping exercise the Eustachian tubes, safely and naturally. Simply place it firmly up against the nostril opening, forming an airtight seal and hold the other nostril closed. CANVAS POUCH. X3 MAGNIFICATION LENS. 2.5V HALOGEN LIGHT WITH LONG LIFE BULB GIVES BRIGHT AND COOL LIGHT. POCKET CLIP. Dwyer Photophilic Pressure Switch / Gauge Series 3000 NIB. 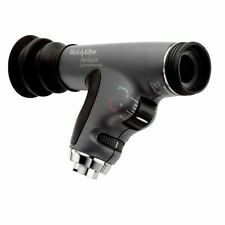 2 Welch Allyn Ophthalmoscope Handles 71670 Rechargeable 3.5v - No Battery . Condition is Used. Shipped with USPS Priority Mail. An ear, nose, and throat doctor, or ENT, is not the only one who can benefit from possessing a diagnostic otoscope. With an otoscope in your safety equipment you can make an important impact on your family's health. If your loved one tends to develop auricle pain on a regular basis, having an auriscope in your medicine cabinet will help you to determine if a physician visit is required. What kind of otoscope should you buy? Optics - Look for a unit that uses halogen lighting and fiber-optic technology for unhindered diagnostic observation of the ear canal. Specula - You can buy ones with either disposable specula or reusable specula. If you don't mind sterilizing it yourself, the latter could be a better choice. Batteries - You can find this equipment in styles that use disposable batteries and styles that are rechargeable. In addition to your preference on type of battery, be aware that a pocket otoscope will need less battery power than a larger one carried in a case. Magnification - Standard magnification is 2.5x to 3x. Some models, like the Welch Allyn MacroView, have been developed to provide even easier viewing. Case - Decide if you can get by with a zippered leatherette shell case or would need the added protection of a hard case. What options do different brands offer? 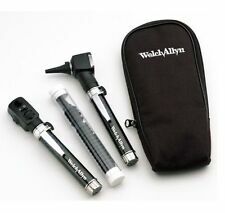 Welch Allyn - This company has the PocketScope with a removable head to expose a diagnostic throat illuminator and the Pneumatic Otoscope with halogen lamp and rotating lens as well as otoscope/ophthalmoscope diagnostic sets. Their KleenSpec disposable specula are available in different sizes ranging from 2.75mm to 4.25mm. Dr. Mom - Their Slimline pocket otoscope was created by a physician and offers lighted ear curettes. The 3rd generation and 4th generation models have True View full-spectrum LED lighting. RA Bock - They have a fiber optic model with three sizes of reusable specula or an available adaptor to allow use of disposable specula. ENTO - They have a digital version with a computer-connected camera to easily observe the ear canal. Otoscope Physician Approved Ear Care Professional Home Medical Diagnostic - This is the SPECv3 Fiber Optic LED model. 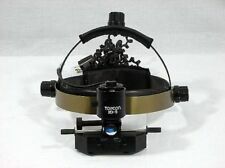 Is an auriscope easy to use? Practice using the instrument on healthy auricles first in order to gain experience viewing normal colors, textures, and shapes. Then, when using it for diagnostics, you'll be able to notice when cerumen or fluid builds up in the auricle or when tissues become inflamed. Product details should include positioning descriptions and instructions.